Ok, so I know I need to get better at taking pictures of my completed puzzles. To be fair though, I didn’t know I would be starting a blog and publishing them. I usually just text a picture to my mom and daughter. I’ll do better – promise! This puzzle is not the image I would usually pick, but it was a thrift store purchase, and a 1500 piece Ravensburger for 99 cents is too good to pass up. I enjoyed it very much, perhaps my taste in puzzles is changing; either that or I’m just an addict and will do whatever jigsaw I can get my hands on. This picture is deliberately a little out of focus and far away – I don’t want to give away the answer if anyone has this puzzle. Had a great time completing this one. I enjoyed the logic puzzle aspect of it, in addition to the jigsaw assembly. The characters “talk” to each other and by what they say you have to determine where they fit into the picture. This puzzle is two-sided, with the word “congratulations” printed all over the back in several different fonts. It’s very helpful to check and make sure you’re putting the right person in the right spot. Would have been great to have a glass table top to work on instead of having to lift up pieces to check. Super fun! Another collage and thrift store purchase. Easy assembly, and it was fun to figure out who everyone is and to reminisce about TV shows I watched as a child. There’s even Bill from Schoolhouse Rock! Here’s another White Mountain that fit together so tightly it could be stood on end! We ordered this puzzle and I put off working on it for a while because it was on the “challenging puzzles” page and I needed to be in the right mood. I did not find it to be that difficult actually, and really enjoyed the entire assembly. Don’t be frightened away from challenging puzzles, sometimes the challenge is just what you need and sometimes it isn’t as difficult as you think it will be. Perhaps my favorite puzzle of the year so far; gorgeous artwork by Aimee Stewart, not an overly difficult assembly, and 2000 pieces to keep me busy for a few days. My daughter got this for me as a gift, what a sweetie! I can’t recommend this puzzle enough, beautiful and fun. Another gift, this one from my mom. An easy assembly, and fun to look at older ads from Coke. Aquarius is a puzzle company I hadn’t heard of or assembled before. Pretty good quality as far as I can remember. I did NOT enjoy this puzzle at all. If it weren’t for my husband working it with me and making me keep going I would have stopped halfway through. The quality was good enough, but the artwork was fuzzy and indistinct which made it quite difficult to find pieces you’re looking for. Not a fun one in my opinion but for 99 cents, it occupied me for a while. This puzzle bums me out because after it was already purchased and assembled I saw that it was also made into a 1000 piece by Ravensburger Still, it’s Aimee Stewart and her art style is a favorite of mine. The pieces were unbelievably crisp and clear, very very nice quality. Only drawback was quite a bit of glare on the darker pieces at night under the lights. Fun puzzle. I love coffee and jigsaws, so put the two together and it’s a good combination. The quality of the pieces was quite good, although as you can see the finish was somewhat shiny causing glare under lights. There was also a poster included in the box – added bonus! Another beautiful puzzle by Aimee Stewart. Much more difficult than I had expected, but still a fun assembly – I enjoyed the challenge! Beautiful image reproduction on the pieces, only drawback was the shiny finish. Another new puzzle company that I tried out. The pieces were satisfactorily thick with no image lift, and they fit together quite nicely. This was an easy puzzle for me, super fast assembly – I started in the morning after hubby left for work, and was done before he got home! Another Cobble Hill, the pieces feel so nice and the matte finish is a pleasure especially after working several shiny puzzles. Fun image, it makes me think of my mom who always had plenty of buttons, pins, thread and scissors for whatever repair work we needed on our clothes. There are always so many fun things to discover when putting together a Colin Thompson puzzle. The kitchen cupboard has many drawers for cake, little toilet bowl egg cups, a hotel made of bacon and much much more! A completely enjoyable assembly, beautiful artwork and the finished puzzle would be excellent for framing. Interesting jigsaw. My first from this company, and I would say the quality is satisfactory, piece thickness was good, image reproduction was slightly fuzzy but I believe that was the artist’s rendering. This puzzle is grid cut, with basically only 2 piece shapes. It was the first time I was unable to assemble all the edge pieces first. Most were a solid color, except the sides and certain parts of the bottom edge with writing. I connected what I could, and had to wait until the puzzle was almost complete before I was able to finish the edges. Nevertheless it was a fun, informative puzzle. Excellent thrift store find. My first Gibsons puzzle. 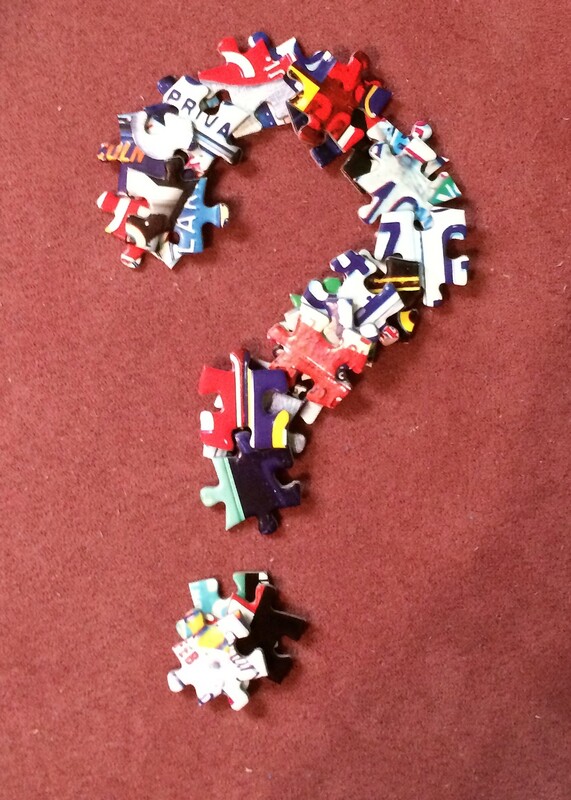 If I hadn’t found the Jigsaw Junkies website I would probably not even know about some of these puzzle companies. The brand comparison on that site gave me confidence to try new companies I hadn’t before, because I knew what kind of quality I would be getting. I enjoyed the Gibsons brand which is another puzzle with a waxy finish, and the artwork by Mike Jupp is so fun! Another collage – of course. This was really fun artwork, there weren’t only human couples there were plenty of fun things that make a great pair – chips and dip, cookies and milk, ebony and ivory piano keys, Buzz and Woody, etc. This is another one that is fun to do with others while talking about the couples and figuring out who or what things are. Gorgeous puzzle, but I had some issues with the quality, which is rare for Ravensburger. On the plus side I wrote to Ravensburger and they replaced the puzzle for me. As you can see the piece cut is extremely visible, the piece fit was extremely loose, there were a few warped pieces and pieces still connected, and a ton of puzzle dust. But don’t let that stop you from buying from Ravensburger, because they are the company I compare all other puzzles to, and if you ever do have an issue with quality they will take care of you. Beautiful puzzle. I must have been on a tear in August, this was my FOURTEENTH puzzle for the month! Wow. I love all the visual puns and it was fun to see how many movies we could name. We didn’t get them all. FYI if you’re looking for the guide to see the names of all the movies the website listed on the box no longer has the key. If you email Sunsout they will send you the list. Another Aimee Stewart, cause it’s just gorgeous! It was way more difficult than I thought, and took me longer than the average 1000 piece. Still, I’m stubborn as anything and the end result is beautiful. Excellent quality pieces, and piece fit; just an all around fun puzzle to assemble even with the extra challenge of all the green areas. I saw a review of this puzzle on Jigsaw Junkies, and fell in love with the image. It was the first puzzle I purchased with the intent of gluing and framing it; isn’t it a beautiful, romantic image for the bedroom? This was also my first puzzle from Schmidt, and I must say I was even more impressed with the quality than I expected to be. The finish on the pieces feels almost luxurious, the pieces fit together satisfyingly well without being so tight you had to push them into place, and the image quality is amazingly bright and detailed without being too over the top. I would definitely buy many more Schmidt puzzles without hesitation. The quality of this company impressed me, and once my self-imposed puzzle buying ban is over I’m looking for more! BTW, the puzzle is framed and looks amazing. Another fun collage puzzle. When we got this one my husband and I looked at the box and counted up how many of these books we had read, it was around the same number of books, but none of them were the same except for The Cat in the Hat! Lots of little sections of the puzzle easy to pull pieces and assemble without the aid of the box, which I love. It was quite a fun and quick puzzle, although the piece cut is very visible once you’ve finished. Of the first four puzzles I completed this month, 3 of them were by Aimee Stewart! I guess you could say I enjoy her work 🙂 There is just something about the colors in her art and the way she uses them together, it’s beautiful. This was easier than the Glorious Vintage puzzle, but still loads of fun to assemble and makes a gorgeous image suitable for framing. Again, I can’t show you the whole finished puzzle, it’ll spoil the fun! On the box are beautiful ladies modeling swimsuits, and the finished puzzle is how they’ll look about 50 years in the future. I loved this puzzle, it’s so much fun to get to the end and see all the little jokes in both the foreground and background. The Jumbo quality is awesome and the puzzle feels lovely to run your hands over (which I always do). I must have been having balance issues when I took a picture of this because it is crazy crooked and I don’t even have the whole puzzle in the picture! In my defense I didn’t know these would end up being published in a blog. Apologies. My first Heye puzzle and oh dear, I’m in love with this company too! The pieces are a little smaller than average, but it doesn’t matter because they feel sturdy and dense and fit together very well. The image reproduction was stellar, really beautiful and detailed. After this puzzle I had another small break from reality and purchased a LOT of Heye puzzles. I love the triangle boxes of the cartoon puzzles, and that you get a ginormous poster inside. Here’s another puzzle I won’t show the whole picture of. Like the Wasgijs, the image on the box isn’t what you puzzle, you have to figure out what would happen if….. For this one, the cover of the box shows what our hero wants to happen when he buys a lottery ticket. The puzzle itself shows what if his ticket was the winner, but he lost it. I absolutely love the art of Geoff Tristam. It’s a fun cartoon puzzle, which I enjoy doing very much. Uh, I now own all 16 What If puzzles. I clearly have an addictive personality!!! Anyone see a theme going on here? I am slightly off my rocker, but having an awesome time! This is another of the original Wasgij puzzles, what is everyone on the box cover looking at? Fun, fun, fun. Something is amiss in the beauty salon, just look at the poor guy up above trying to help. Great image, great puzzle, great time. When I first saw this puzzle I though, “That’s kinda cool”. Then I read the little blurb about the artist and I had to own it. Gregory L. Blackstock is an autistic artist who defines the world around him by identifying, ordering and arranging things. His artwork helps him find a sense of order in a chaotic world. I have two children with autism, and completely understand his need for order and an outlet for the stress of dealing with people and things that are confusing or upsetting. In addition to being excited to get a jigsaw with artwork by a person with autism, it’s a fabulous fun puzzle that is hard to walk away from. Once you pull pieces for an egg and assemble them, it leads to pieces of another one, and so on and so on. The Pomegranate quality is exceptional, and their boxes AND puzzle pieces feel amazing. Thick and sturdy and soft feeling at the same time. LOVED this puzzle! Oh my, what is everyone looking at? Another fun Wasgij puzzle. Cartoon puzzles have always been my favorite and the Wasgij concept makes them even more fun for me. I love figuring out what’s going on or what will happen next. It’s more of a challenge to only work from the pieces and not from the picture on the box, and it makes it more interesting. I know not all the puzzles have the same artist, but so far I’ve worked only the ones by Graham Thompson, and I love his sense of humor.